The coverage of the State budget in today’s West Australian looks to me like little more than a jumble of ill-considered low blows — for example, Mike Nahan (who sounds increasingly like a Liberal lackey with every column) criticises it for not being as reformist as the Federal budget, without stopping to note that Tuesday’s biggest reform was allowing the ATO to pre-fill our tax returns so we can file with one click (great though it is, it’s hardly earth-shattering). 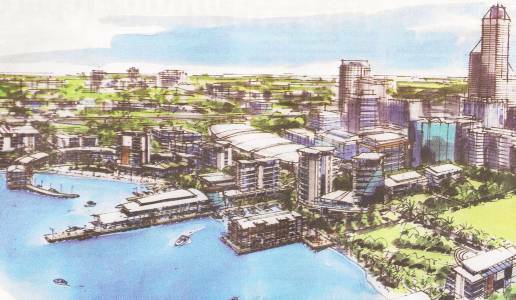 But today’s paper did reveal something that I didn’t have time to confirm yesterday: no funding has been allocated for the new footy stadium, the still-under-wraps foreshore development, or most worryingly, the Northbridge Link project. Assuming the project goes ahead, the earliest anything could happen is July 2008. And that would require it to be funded in next year’s budget — which may well focus on vote-buying measures for the February 2009 election instead. So the vista above is likely to continue looking like that for a while. Possibly a long while. Now I know what Charles Landry was on about when he said that Perth’s immense potential is “blocked in innumerable energy-draining ways”. As today’s West Australian front page reveals (but without pictures! 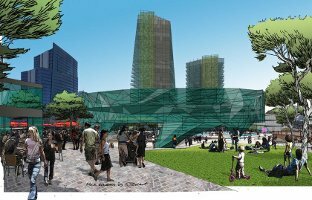 ), the Northbridge Link masterplan was released today. 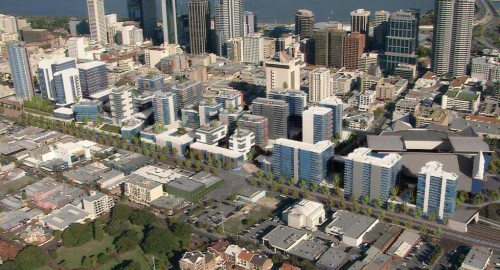 Basically, the plan involves office and apartment buildings over a partially-sunk railway line, the extension of King, Milligan, and Queen Streets up to the railway to create Euro-style boulevards, and the creation of several pedestrian lanes and miniature public squares. 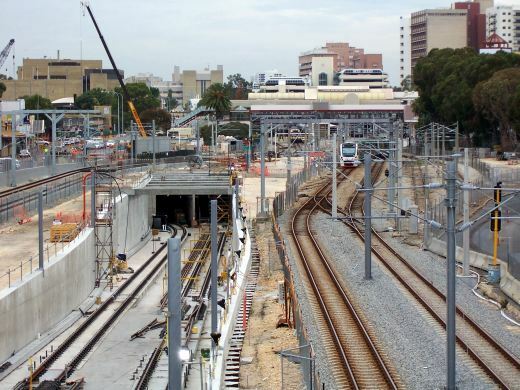 I still think it’s a complete cop-out that the Fremantle line will be sunk only between the station and Lake Street — the trains will dip underground for a hundred metres, and then BAM! suddenly you’re back at ground level again (albeit, in this plan, still under buildings). This means that the region where the railway stays at ground level will remain impenetrable to north-south pedestrian flow, except for an (admittedly nice) bridge-plaza structure at Milligan Street. There’s also a big question mark over the Entertainment Centre site — the master plan talks about replacing it with apartments and others have mentioned moving TV studios there (à la Martin Place in Sydney), but that depends entirely on what Kerry Stokes wants to do. But aside from these (relatively minor) qualms, this plan looks to be mostly a Good Thing. 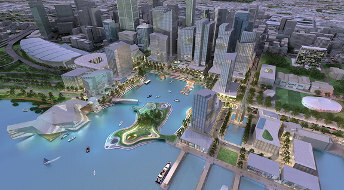 There was enough guts to go ahead with a reasonably-tall building (the 25-storey planned for the centre of the Horseshoe Bridge, which should be quite cool) and the figures for office and retail space are big enough to give the area some actual value. The plan includes some nice green roofs, there’s actual honest consideration of the need to encourage vibrancy through pedestrian flow, and the proposed new bus station is an excellent feature. 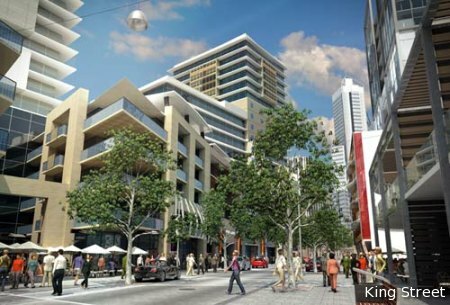 To top it off, the plan to beautify Wellington Street and Roe Street is awesome (and long overdue — even Adelaide’s North Terrace has long been way nicer than our northern street).